Traditional comics publisher Archie has a stable of super-heroes, though they never quite stuck. 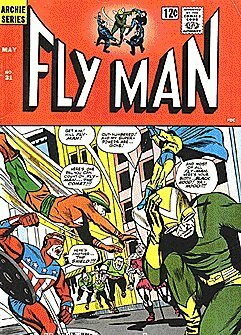 On of the attempts to repackage them took place in 1966, this time under the Mighty Comics imprint. This was meant to be less Silver Age and more Marvel Age. 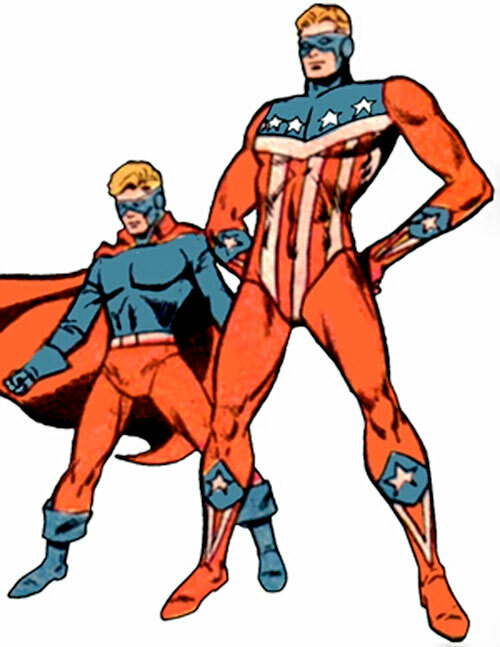 Thus did a new version of the patriotic hero the Shield appear, as part of the Mighty Crusaders hero group. Known Relatives: Joe Higgins aka Shield I (father). Group Affiliation: The Mighty Crusaders. Base Of Operations: NYC ? Height: About 6’2” Weight: About 210lbs. Bill possesses no super abilities of his own. He relies entirely on his own combat prowess and the suit’s indestructible properties. Bill Higgins is the son of Joe Higgins, the original Shield, who was petrified by the Eraser. Donning a spare Shield costume, he vowed to continue his father’s work. Sadly, in his private life, Bill was a total washout and at times seemed cursed. Genuinely clumsy, he couldn’t hold down a job. When his girlfriend Nancy Zenith hired him to work in her employment agency, not a soul came looking for a job and she was forced to fire him. When his father was revived by the Comet, Bill gave up superheroing and joined the Air Force. Bill is a troubled character. He slips into his Shield guise when he feels oppressed by life. After his sojourn in the Air Force, Bill, missing his life of adventure, could become a member Checkmate as a Checkmate Knight. Secret Identity, Unluck (used exclusively in his civilian identity). Chemicals (x3) [BODY 01, Acid: 08, Bomb: 06, Grenade Drawback, Misc. Limitation: Requires One Phase Preparation to use either Power]. Also known to use various mundane surveillance equipment.